I'm not sure I have been able to fully convey my new love affair with kale. I have been seeing this leafy green on my plate three to four times a week recently. And, I have been doing it behind my husband's back. The carnivore is not a fan. But, maybe some of you carnivores out there are. So, I thought I'd share my latest recipe using my new favorite green. Start by sauteeing 1/4 of a yellow onion in 4 tablespoons of olive oil in a large soup pot. Then add in one large leek stalk that has been cleaned and sliced. Once these guys are soft, add in about 1 pound of kale. Make sure the leaves are in bite sized pieces. Wilt it down, add more, wilt, add, and so on until it has all been cooked. Then drain a can of garbanzo beans and a can navy beans. Add them to the pot. Finally, add a box of veggie stock (4 cups). Combine the ingredients thoroughly. Add kosher salt and pepper to taste. Put on to simmer for at least thirty minutes. If you can resist this lovely dish, let it set in your fridge over night so the flavors can fully combine. Reheat slowly on the stove. Top with grated parmesan before serving. And if you are a carnivore, you might want to consider adding some salted pork pieces. They would mix well with the beans and greens. 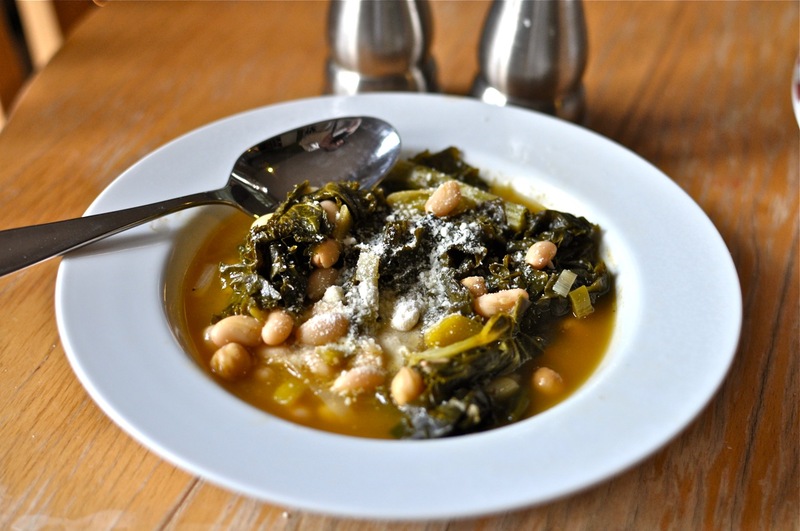 Either way, the creamy white beans and the nutty chickpeas set off the strong leeks and flavorful kale perfectly. Topped with the salt cheese, this soup is so satisfying. If you haven't tried kale yet, I suggest picking up a mess of greens at your local farmers' market or even your grocery store. Who knows, maybe you will develop your own love affair.